Anna Christy (Blonde). Photo by Cory Weaver. 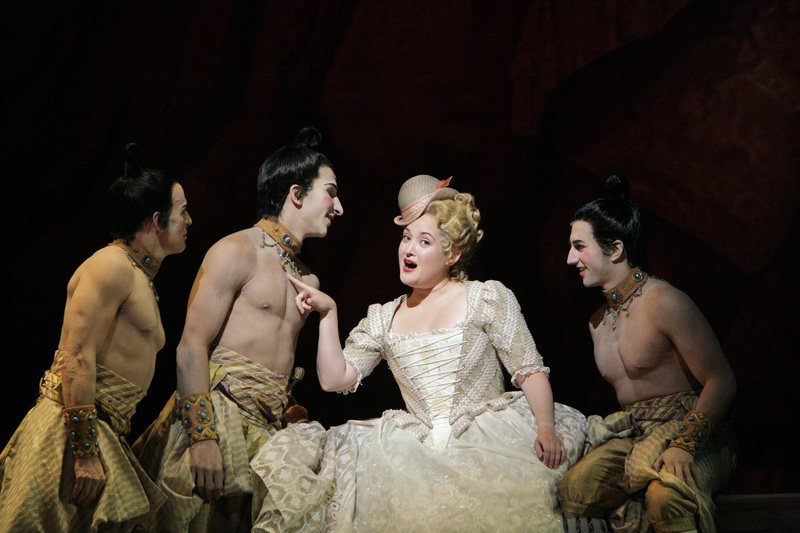 As the mind wanders during San Francisco Opera’s “Abduction From the Seraglio”—and it does, regrettably, during the nearly three-hour production—it’s easy to close your eyes, listen to the pleasant music and imagine yourself instead at a touring company’s presentation of some Gilbert and Sullivan operetta, chock-full of patter and asides that give such presentations their charm. Alas, reality intervenes, and no such quality redeems this tiresome effort. In any other season, it would be easy to dismiss this “Abduction” as a case of institutional inertia. Like so many warhorses in the company’s repertoire, this production (in partnership with the Chicago Lyric) of Mozart’s opera singspiel, a breakthrough for the composer in his time, already has a fusty look and ho-hum staging, though it has only just debuted. But this is a different year for SFO, the first in which General Director David Gockley’s mark is being felt in its full force. So, after a respectable “Il Trovatore” and a riveting “Il Trittico,” audiences had a right to expect something less, well, expected. Not that there was anything particularly horrible on display; the orchestra (for the first part of the run conducted by the 29-year-old Cornelius Meister in his U.S. operatic debut, then, for the last two performances, by SFO Assistant Music Director Giuseppe Finzi) sounded at least competent, and the lead singers (Matthew Polenzani as Belmonte and Mary Dunleavy as Constanze) performed dutifully, if not always admirably—soprano Dunleavy in particular strained a bit during her Act II “Tortures” aria. Perhaps the nature of the libretto—which one longtime observer calls “dumb, dumb, dumb,” an assessment that isn’t disproved by Philip Kuttner’s cornball translations of the dialogue in English—sentences this opera to be received with so many yawns by a modern public. The tale of a lady sold by pirates with her servants into a Turkish harem and pursued by the steadfast Spanish noble who lost her has a mechanical predictability, much the worse for its lack of motivational nuance. All the characters seem arch and stilted, from the hapless lover Belmonte to Pasha Selim, who all but leers at the delicate beauty of Constanze in communicating his lust. Moments of genuine levity occur when the guard Osmin appears (sung, with Harvey Fierstein bravado, by bass Peter Rose), along with the antics of servants Pedrillo and Blonde (the tenor/soprano team of Andrew Bidlack and Anna Christy), who make their own love story come alive in funny fits and starts (Adler fellow Bidlack a sweet-voiced clown, Christy a Judy Holliday lookalike with a bright delivery). After threats of torture and execution, followed by a doomed escape, all conflict is resolved in a moment of uncharacteristic (if not implausible) magnanimity on the pasha’s part, and the paramours are reunited. That nobody gets a breakout moment from the unstimulating staging by Chas Rader-Shieber is perhaps more the fault of designer David Zinn, whose stage-within-a-stage set forces the director to scrunch the action on a tiny raked-platform box or confine it to the linear apron in front of it. And there can be no more excusing Jonathan Rider’s fight direction, in which the opera’s janissaries telegraph their moves with unintentionally laughable results (same as the supers did their lunges and falls in “Il Trovatore”). Faking it onstage doesn’t have to be so obvious, so perhaps some benefactor could endow the company to enable a visit or two from a Cirque du Soleil illusionist or even a real Hollywood stunt expert. Illusion is indeed what’s missing in this “Abduction,” replaced by overt stage tricks (the arrival of a ship against an ersatz sea backdrop is an early indication of what’s in store). Instead of playing down the Turkish trappings of the libretto and concentrating on the love-lost/love-found theme so inherent in Mozart’s music, this production seems bent on schtick, silly costumes and theatrical effects aiming to underscore the preposterous story. Lovely ideas and their expression in beautiful melodies abound, but you’ll have to close your eyes to hear them. Mr. Simpson has a BA in Journalism from the University of Southern California and worked as an advertising writer in Los Angeles before moving to New York to pursue a different passion: dance. He danced professionally in New York and Boston before founding a community-based modern dance company, Small City Dance Project, in Newburyport, MA. His fiction has appeared in literary journals and anthologies. He was a teaching fellow at Smith College, where he received his MFA in choreography. While living in the Bay Area for 15 years, he wrote about dance for the San Francisco Chronicle and other periodicals. In 2005, he was a NEA Fellow at the Dance Critics Institute, American Dance Festival. For culturevulture.net, he reviews dance, theatre and film. He moved to Santa Fe in October, 2008. He writes for "Pasatiempo," the Arts magazine of the "Santa Fe New Mexican."